Tacos aren't really something I tend to make and when I've made them in the past I've used the pre-curled crispy tacos, which is a whole other experience to the ones I made today. I am not converted to warm, soft tacos, which are just a little charred. I actually saw a recipe for meat tacos in a cookbook I was browsing through. I can't remember what the cookbook was. I was browsing through a few at the library. 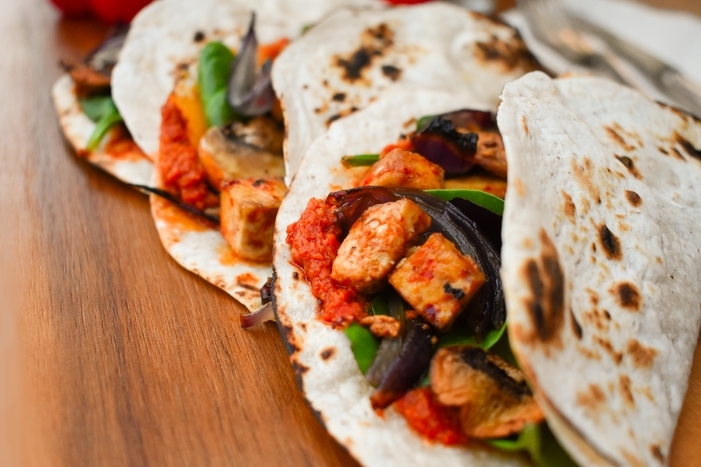 Anyway it was the soft taco shells that caught my attention, so I had a read of how they tackled them and when I saw M&S had in their new chilled sesame, chilli and coriander tofu I knew just what I wanted to make with it. 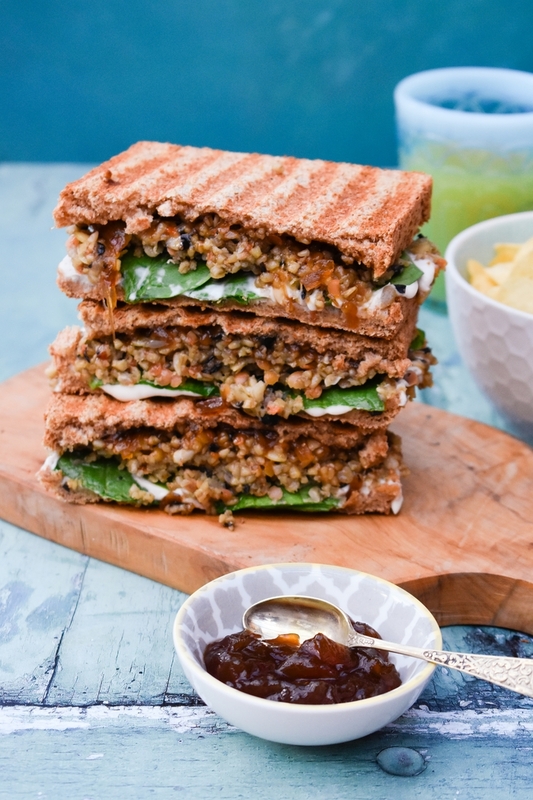 These veggie haggis and onion chutney toasties are my second recipe for Burns Night this year. They aren't part of a traditional Burns Supper, but would make a really satisfying lunch or a more casual dinner with some salad and crisps on the side. There's just something so comforting about a toastie. I don't know why that is, but I would never say no to one. This toastie is a layered masterpiece. It starts with a thick layer or cream cheese on thick wholemeal bread, next comes a layer or spinach leaves. On top of that there is a generous layer of warm spicy vegetarian haggis and it's finished off with the other slice of bread slathered thickly with sweet onion chutney and grilled until crisp, with those lovely charred grill lines. Mmmmmmm! That's Graham clutching his vegan haggis, neeps and tatties burger. I'd taken some shots of it on the table, but once I said I was finished taking photos (this is the plight of a food blogger's husband) he picked it up to walk off with it and I asked if I could take a shot while he held it. He told me not to be so daft, but I rather like it. 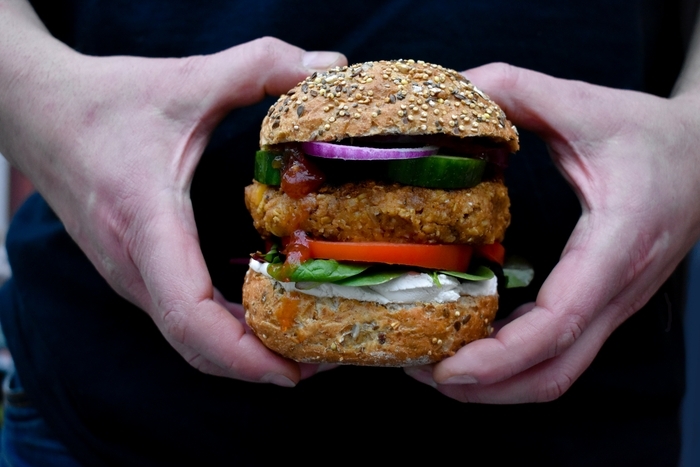 I'm quite behind the trend of taking photos of food being held, but I do like the photo. 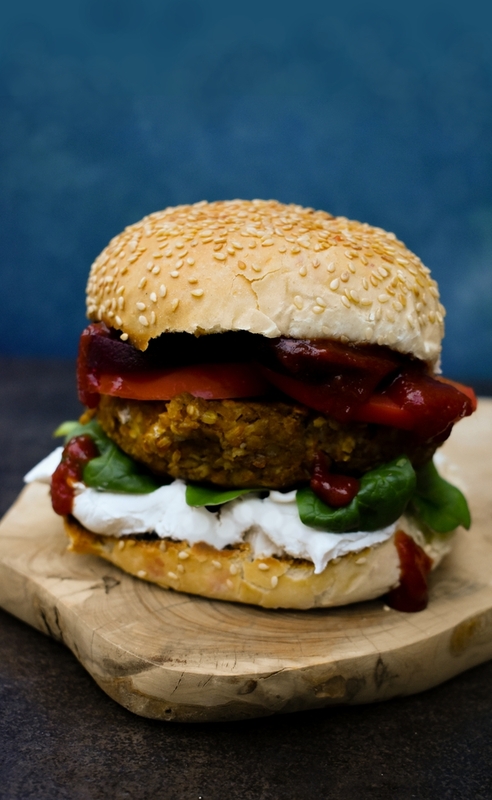 The burger is accidentally vegan and totally instant. These burgers are instant because I used Vegetarian Haggis, Neeps and Tatties fresh meal from McIntosh of Strathmore to make the burgers. 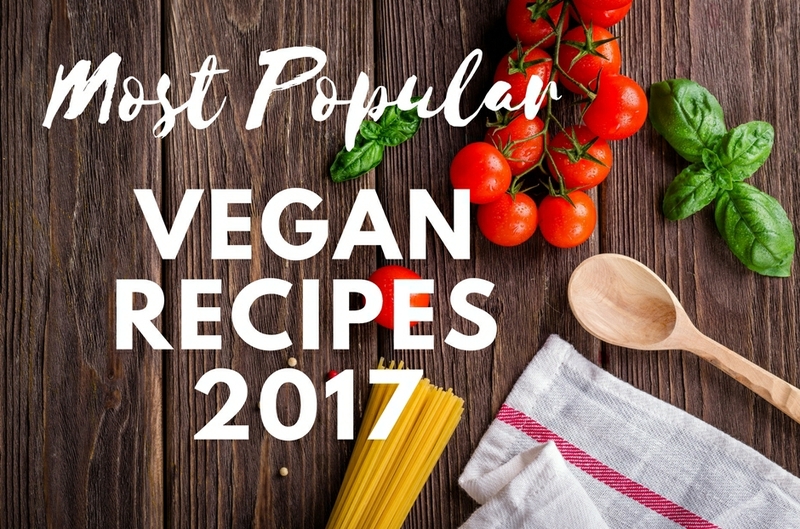 I just mashed the haggis, neeps and tatties in a bowl with some oats and spices, then shaped them into two fat vegan burgers. It only took me about three minutes from start to finish, then a few minutes to cook them. 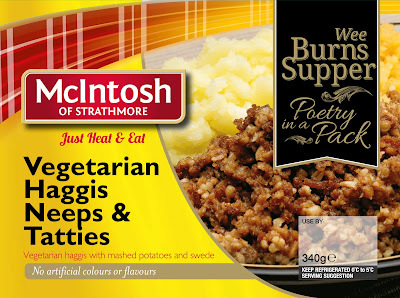 They are accidentally vegan as the fresh packs of vegetarian haggis, neeps and tatties from McIntosh of Strahmore are approved by the Vegetarian Society as suitable for vegetarians, but if you look at the ingredients they are actually suitable for vegans too. On busy nights we sometimes have these chilled meals for dinner. Everyone enjoys them and they;re on the table in seconds. They are a blessing for my mum who never knows what to serve Cooper. 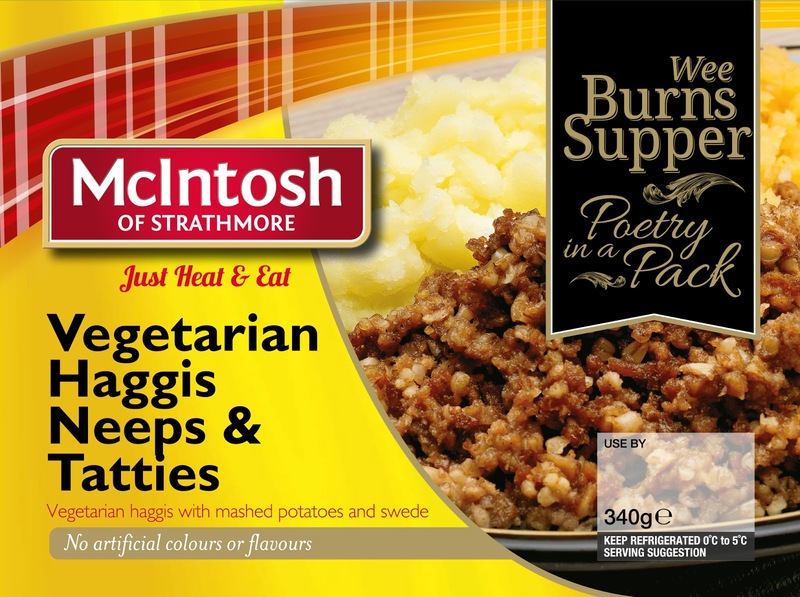 If you can't get hold of these packs where you live, you could mix shop bought veggie haggis with some mashed potatoes and mashed turnip/swede. The cooking time is longer though, so you can forget the instant part. What are haggis, neeps and tattties? We like to portray a myth in Scotland that Haggis are wee hairy beasties that roam the countryside, but in actual fact haggis is a mixture of sheep's heart, liver, and lungs (pluck) minced together with onions, porridge oats, suet, spices, and salt, which is traditionally encased in the sheep's stomach though, but now usually comes in an artificial skin instead. 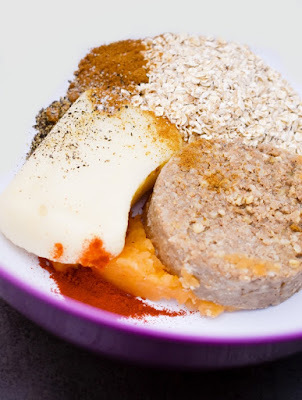 Yes that is pretty bleugh, but veggie haggis is actually gorgeous stuff. As I said veggie haggis (which is also suitable for vegans) is gorgeous stuff. A blend of minced vegetables, oats, pulses, seeds and spices. Neeps is the Scottish word for turnip, which is also called swede, especially in England. It's a basic Scottish crop that is traditionally served with haggis. We boil or steam it and mash it with butter or dairy free spread and seasoned with salt and pepper. It needs nothing more. Tatties is the Scottish word for potatoes. These are traditionally served mashed, alongside the mashed neeps and haggis. The whole meal is served with a creamy whisky sauce and a naughty wee nip of whisky to sip with the meal. This mixture made two burgers. 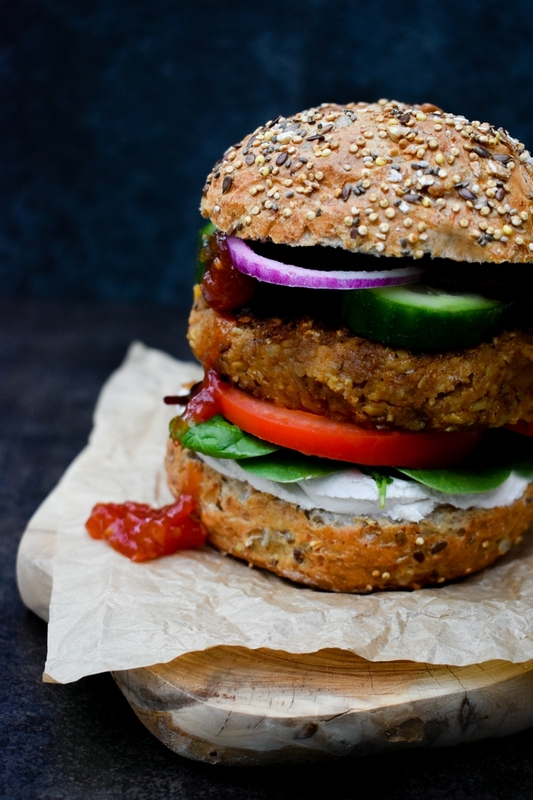 Graham enjoyed his with a thick layer of dairy free cream cheese, salad leaves, slices of tomato, a burger, then slices of cucumber, red onion and tomato relish. I like to add slices of pickled beetroot to mine and I prefer a soft roll toasted just on the inside instead of the crisper roll he prefers. Oh by the way, roll is what we call a burger bun in Scotland, also known as a bread roll, a bap orsome of them which are made with layers of butter in Dundee are known as butteries. A salad in winter? Hell yeah! I admit I eat more soup in the winter and more salad in the summer, I'm sure everyone is the same. 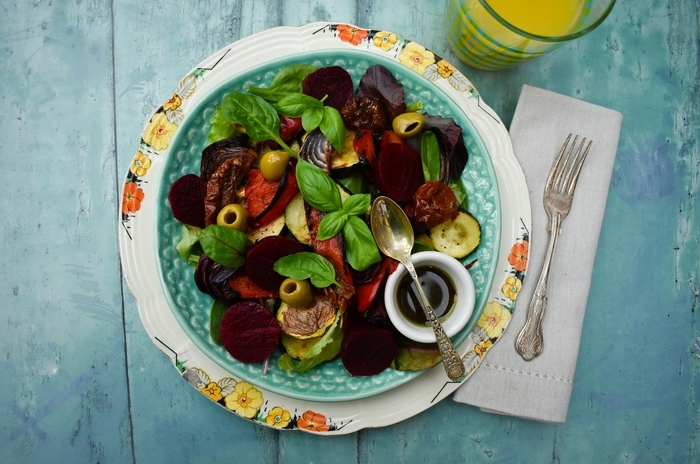 I'm eating lots of tasty homemade soup just now, but today I'm working from home, it's cold and dreich outside, but it's cosy inside and I was craving salad so I was kind to myself and made this roast vegetable, olive and beetroot salad. It was yum! As much as I like a salad in the winter I do think it should be either a warm salad or one that's a bit more substantial like this one. What do you think? As one year closes and another begins I like to look back on the last year. I like to think about what was successful on my blog, what wasn't so popular, what my readers really want and what I can improve. 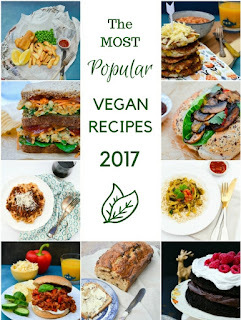 I've had a look back over the year to see which of the recipes I created in 2017 were the most viewed and would like to share them with you. From lunch and dinner to sweet treats for dessert. 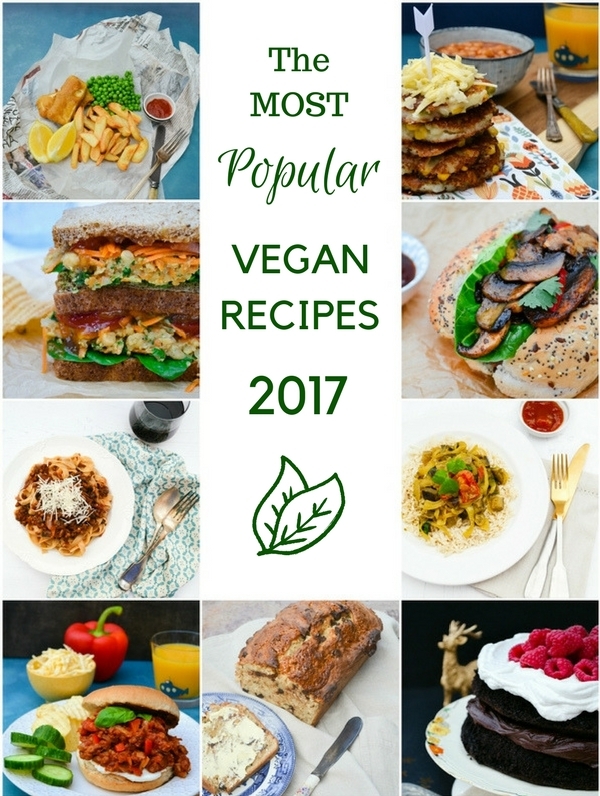 I hope you enjoy them as much as my family and readers have and that you'll try a few.